Each cabin is self-contained with gas stove, wood heater, fridge, indoor toilet and hot water system.The cabins are set separately within the rainforest and offer comfortable privacy and intimacy. Book one, two or all three cabins to share your special times with a partner, family or friends. There are two campfire areas with gas lights, tables and chairs, with shelters at the larger area. All power is 12volt, solar and hydro-electric renewable energy. The LED lighting creates a special ambience, giving a feeling of being somewhere different – somewhere special! If you choose, we can supply the linen for your stay. This includes sheets, towels, teatowels and pillowslips. Please let us know at the time of booking if you wish to include Linen in your price. For all cabins, we supply pillows, blankets and doonas and the cabin is self-contained. You can order a breakfast pack of wholesome Killarney food which includes egg, sausages, tomato, bacon, bread and butter for you to cook. 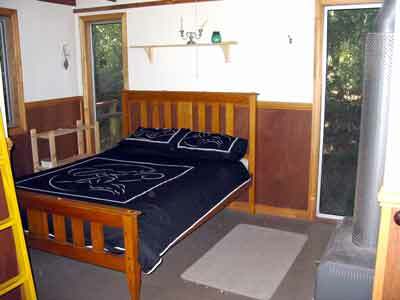 All prices include the night rainforest glow worm walk and the wood for the cabin heaters and the campfire. Call (07) 4664 1599 to make your booking today! A place of romance and discovery... with just a twist of adventure!